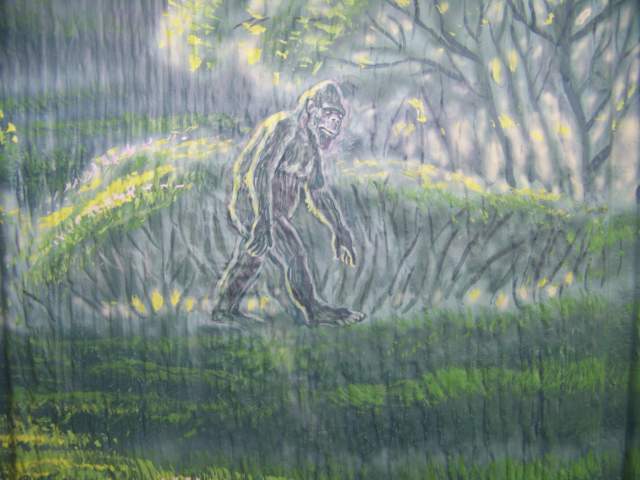 Bigfoot makes an entrance. Why not? 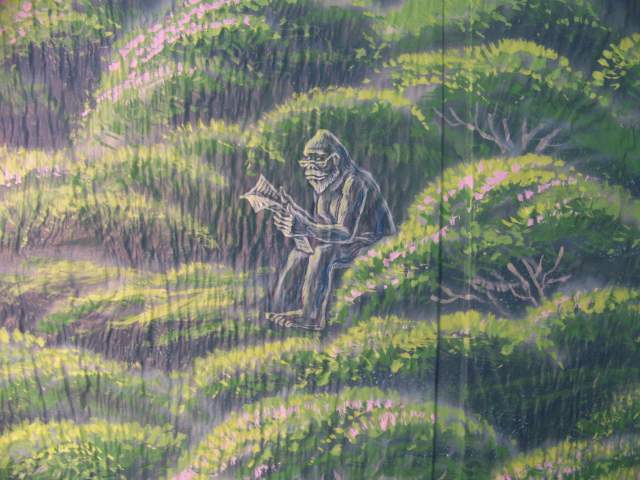 This is Bigfoot's brother reading the morning paper and watching the sunrise. enjoy it also. We have to get some grandkids first though. The east wall. If you look real close you can see the Bigfoot in the shadows. The roosting perches. Notice the clean-out opening, this will have a door when it's finished. 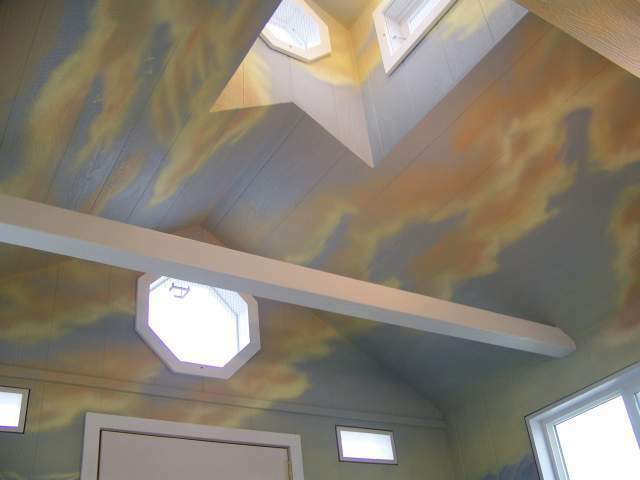 A shot of the sky on the ceiling and cupola. Notice the openings for the doves. 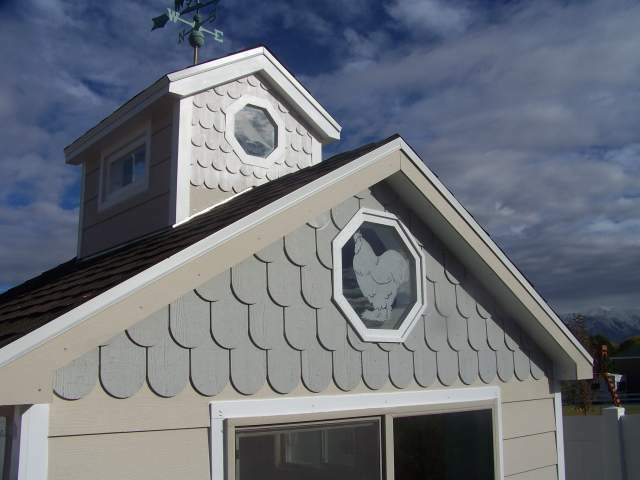 Fish-scale siding and chickens and doves on sandblasted windows. 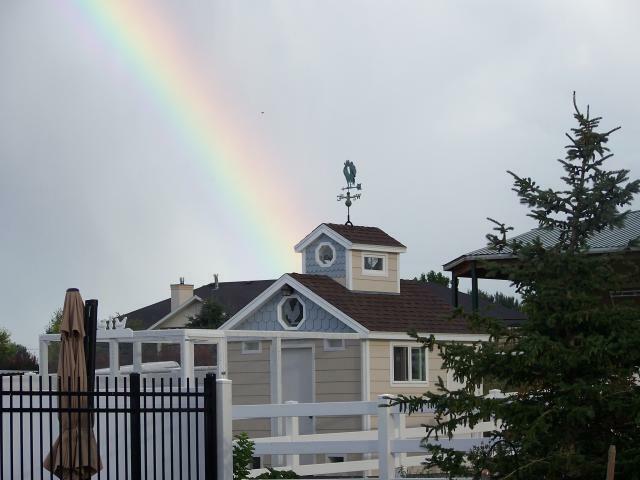 A good shot of the cupola. 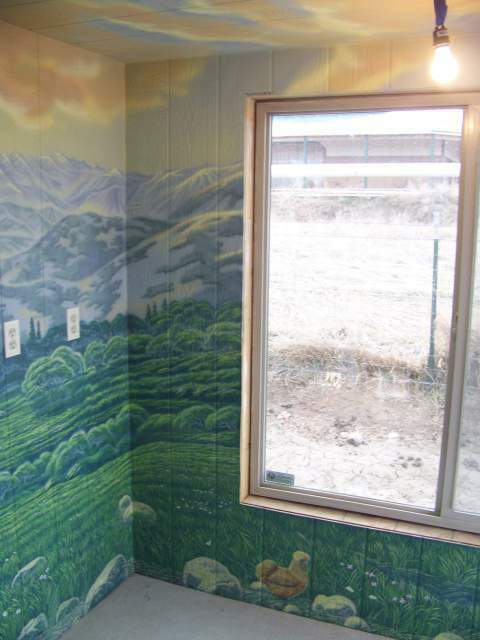 The top rectangular windows remove so it won't get too hot in these Utah summers. 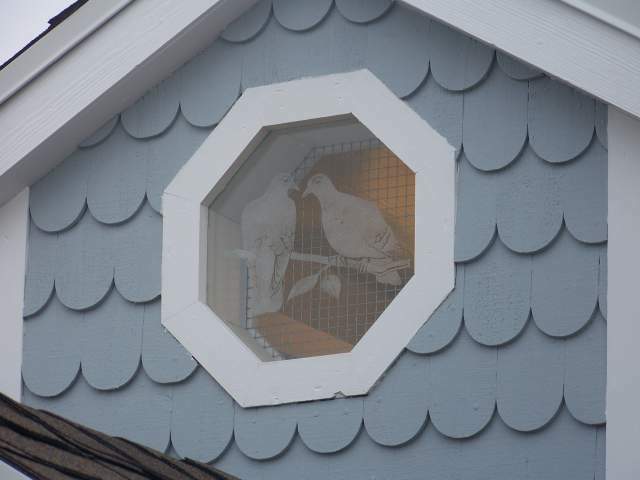 They still have mesh over the openings though to keep the doves in. 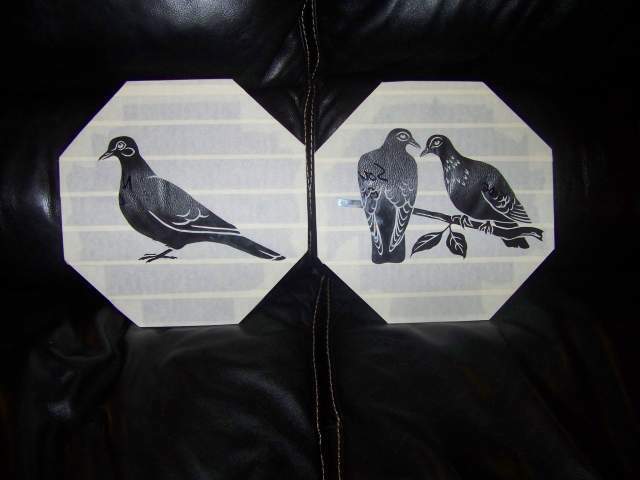 A good look at the pair of dove sandblasted windows. The run and coop. Almost done now. Very, very exciting to see it come this far. Close to getting birds now. 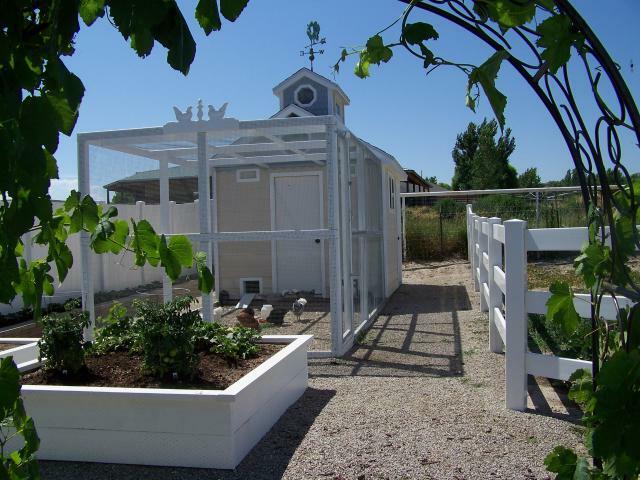 I'll put in a dead tree and trim it nicely and paint it white for the bantams and doves. 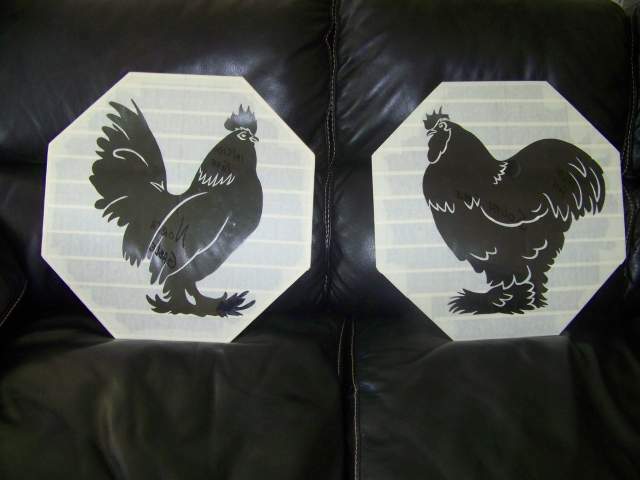 having hens and doves in the coop I figured I'd get the roosters in somehow. Dove work. This can be very tedious to draw and cut this out! sure you all could rip this to pieces. 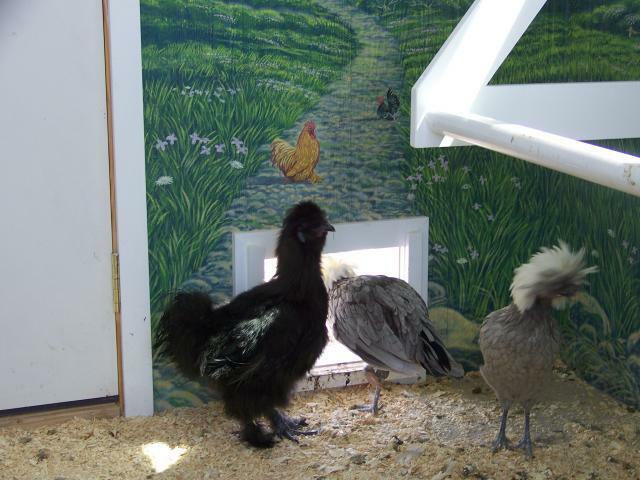 My silkie rooster Papa Roach, with 2 white crested pollish pullets. This is Billy Idol. You should hear his rebel yell, it's weak, but I'm sure he'll learn to beef it up. All the single ladies. 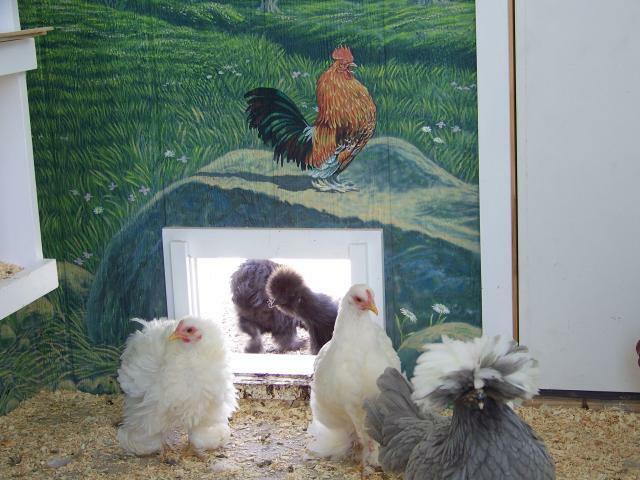 Frizzle, bearded silkies, cochin, and white crested pollish. Cameron. 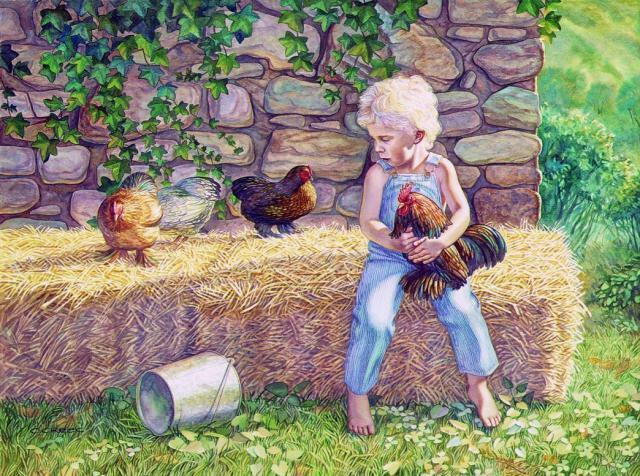 A watercolor painting of my youngest boy and our cochins. Breakfast With Tiffany. 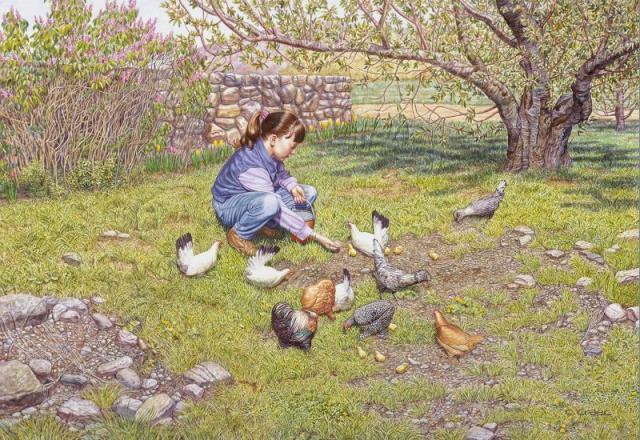 A watercolor painting I did of my niece and bantams. 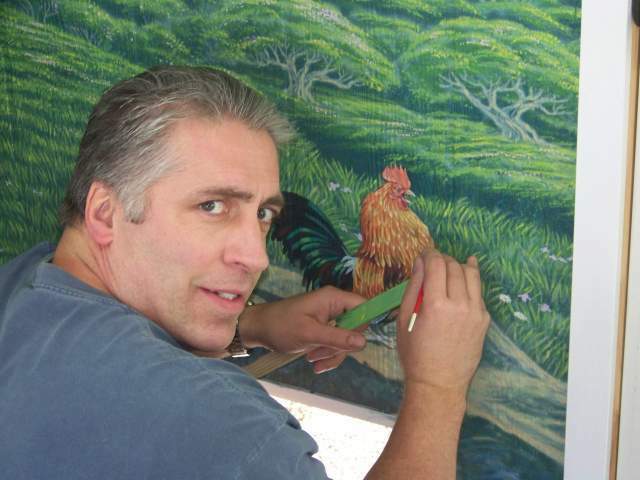 I am so glad I happened by a few years later to see what else you've painted and how you have used it. 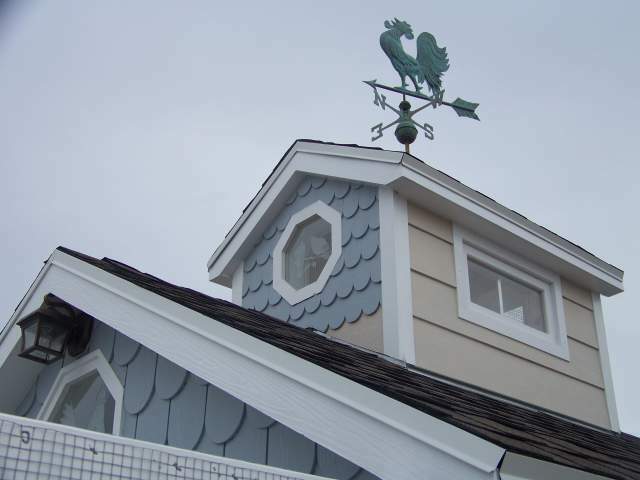 This coop is amazingly finished!! It is not only painted from top to bottom, but also is practically structured. 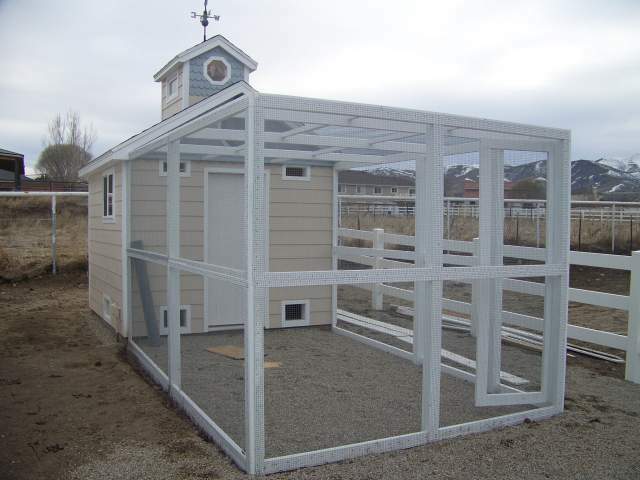 Plenty of room, ventilation, and is built to please the eyes of people viewing it, and to please the hens in it. Very well done! oh my goodness!!!!!!!!!!!!!!! what detail! 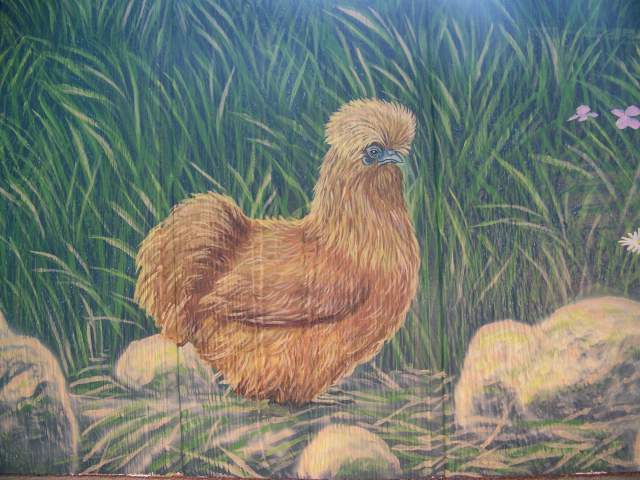 Im wondering what paint you used on the outside of your coop? Very nice. I like it allllllll!!!! WOW! 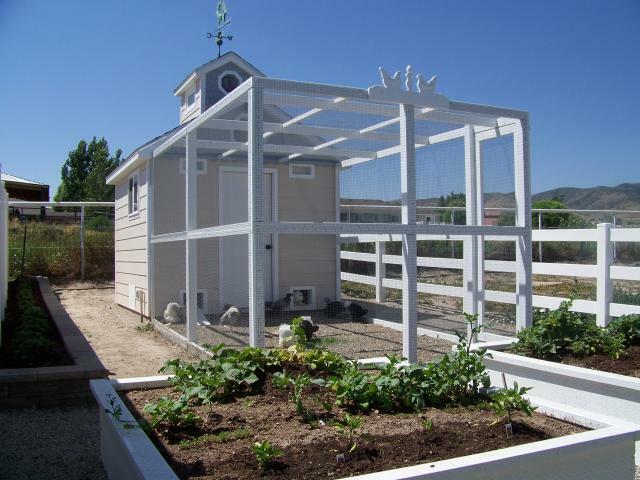 That is one impressive coop! I am in awe. A spectacular design . . . and the artwork! Fantabulous! Did you ever put doves in it too? looks lovely. 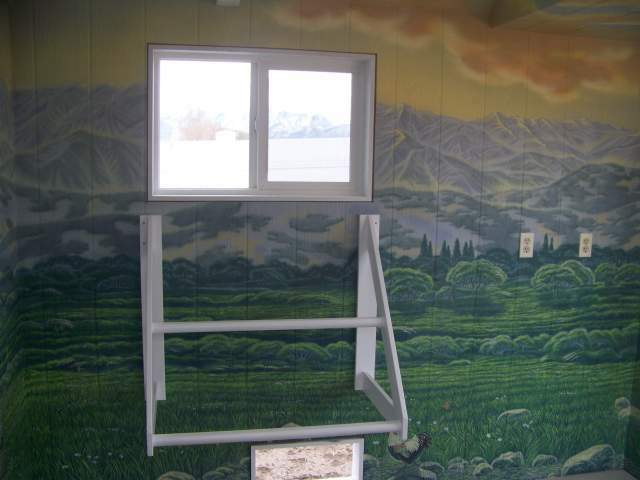 Your murals are truly marvelous. Wow! That is really gorgeous! Awesome murals! Great job on everything! Your work is absolutely beautiful!!!!! 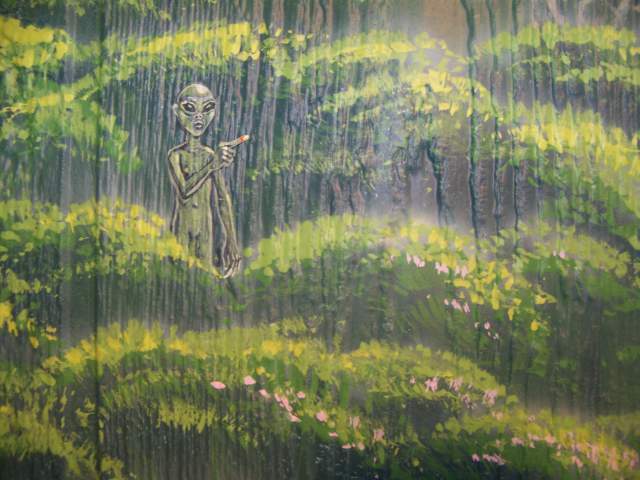 Oh, love the Alien and Bigfoot by the way! Beautiful Coop! I hope you are ok if I link to it at BrighamCityChickens. We're in Utah too! 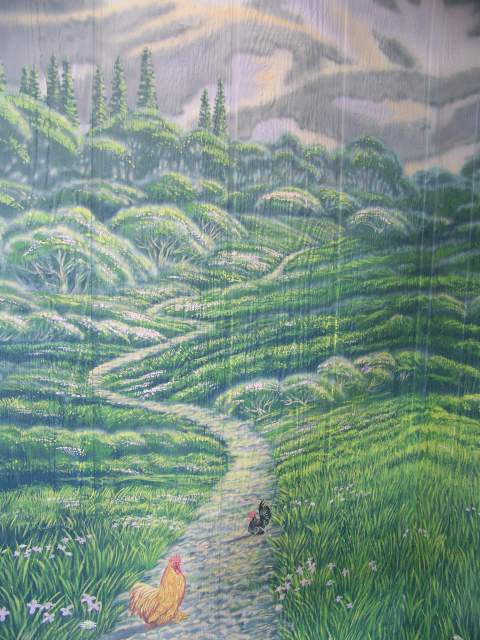 Your painting is so beautiful. You're right, you will enjoy this for many, many years to come. 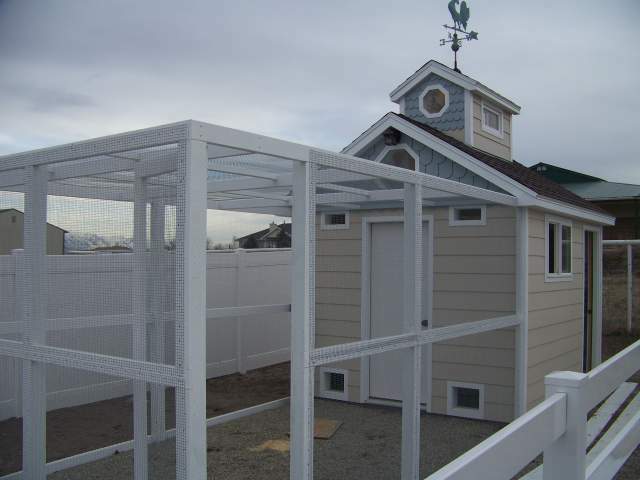 Very nice looking coop too. Really beautiful work. Was wondering where what type of weather you have in your area. Absolutely fantastic!! 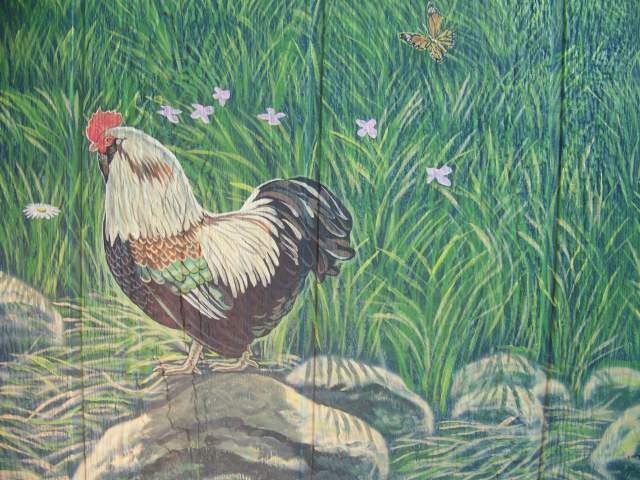 Your art work is stunning, this coop belongs on display!! 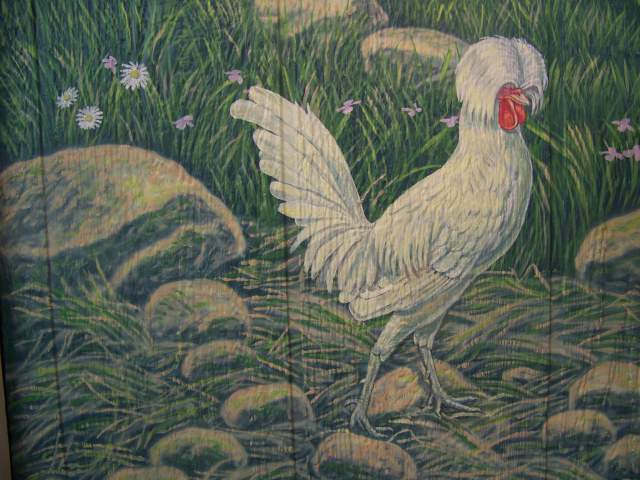 Your lovely selection of girls (chickies) only accent the beautiful artistry. 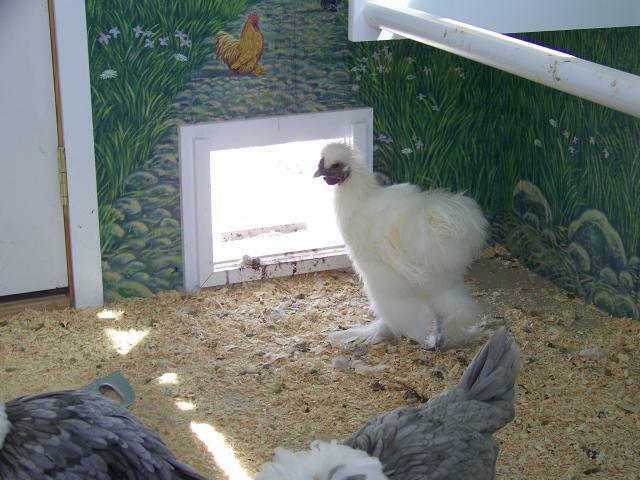 I am looking for coop ideas however..if I show this to my contractor/husband, I'm afraid he will faint! Minus the creative art work, it is a great design! 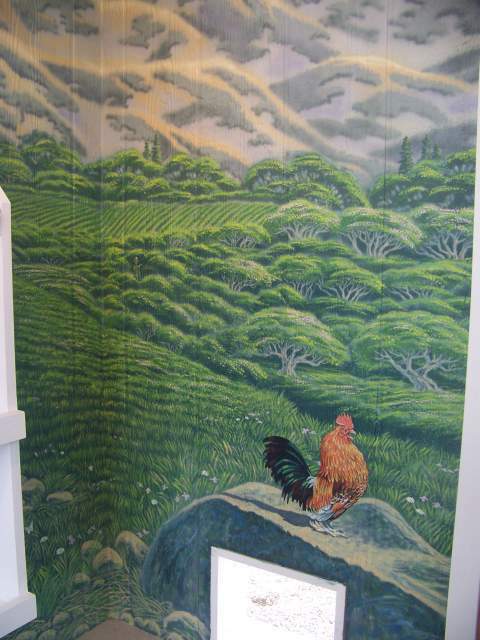 I have loved alot of coop designs but this beats um all. Fantastic! 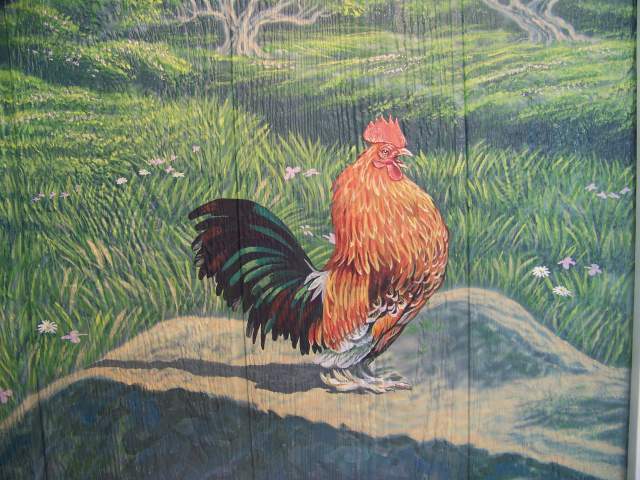 There are so many really wonderful coops out there, but this.....by far the most beautiful coop, inside and out! 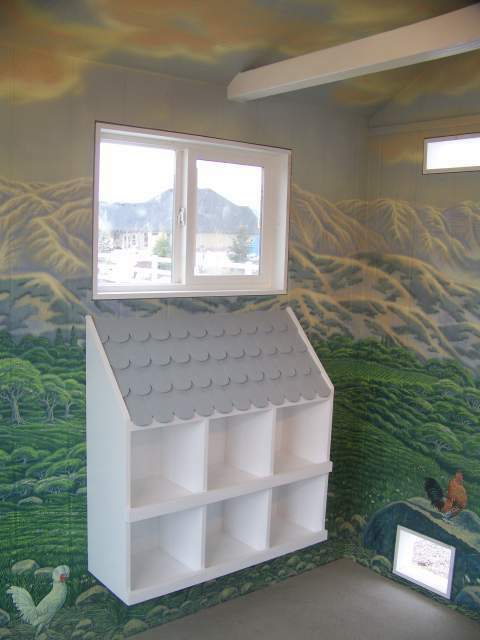 Even without the mural inside- Fabulously whimsical!! I am amazed! This is incredible...thanks for sharing! Wow! Wow, that is amazing! You make me want to hire an artist to do the same in mine. Thank you for sharing your wonderful art and amazing coop! That is absolutely incredible, beautiful work! 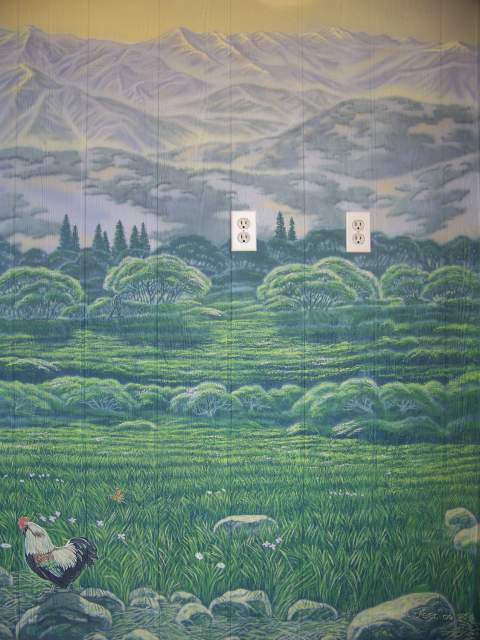 This is akin to the Sistine Chapel for poultry. Kudos and thanks for the "tour"! How much you charge to build one? Serious inquire!!! What a wonderful job! Amazing - can't wait to show my DH. wow is right!i didn't realize it'd be such a treat! 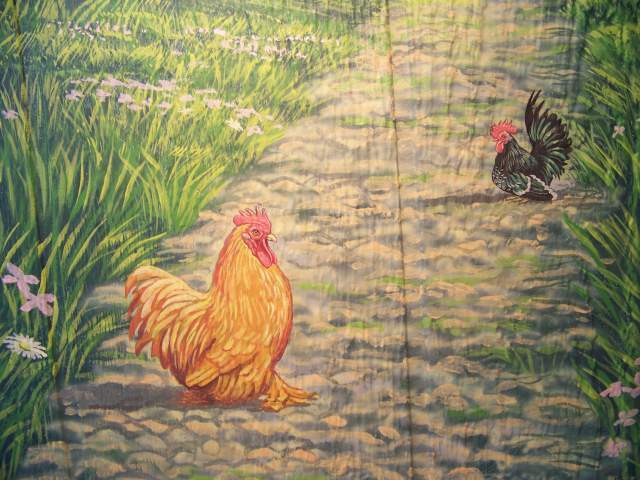 how big is your run?how many chickens do you have? Wow....there just aren't words....Awesome. Thanks for the tour!